Welcome to Roussell's Garden Bed and Breakfast! 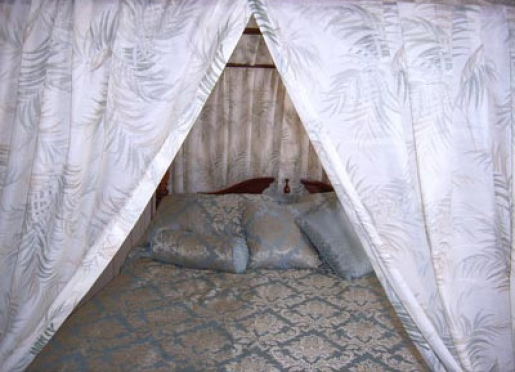 The Mandevilla room has a king-size 4-poster canopy bed, a large dresser w/mirror, a desk w/mirror, a bay window w/a settee couch, and a full private bathroom with a 66" claw foot bathtub, (5 ½ ft.), for soaking & bubble baths, with a rainhead shower. 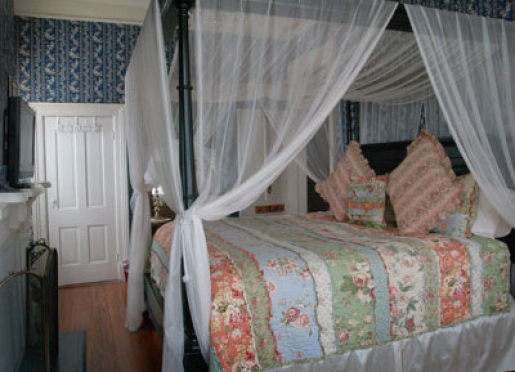 The Azalea room is furnished with a queensize 4-poster canopy bed, a secretary desk w/drawers, an armoire wardrobe for hanging clothes, and a sink/wash basin, (hidden in a closet), for your personal use. This room has a large private ¾ bathroom, with two more sinks, & a full doubleheader shower. 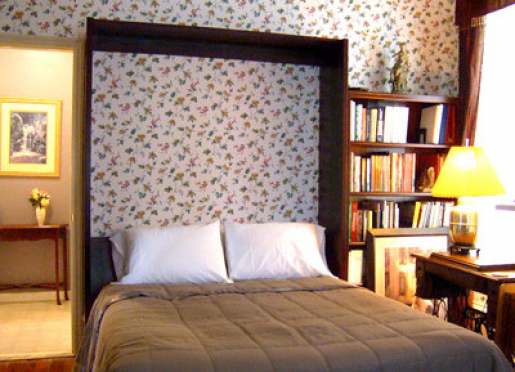 The Camelia room is furnished with a queensize 4-poster canopy bed, a secretary desk w/drawers, and a sink/wash basin, (located in bdrm), for your personal use. This room has a unique private bathroom with a 26" X 48" claw foot soaking tub with a rain head shower. The Parlor room will bring back the experience and charm of visiting home, and sleeping in a queensize Murphy bed, (a platform bed that folds into wall). 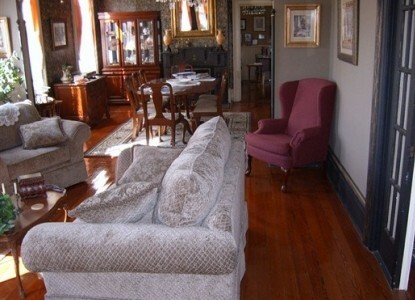 The room has a 26” flat screen TV, secretary desk w/drawers, and a large settee couch. 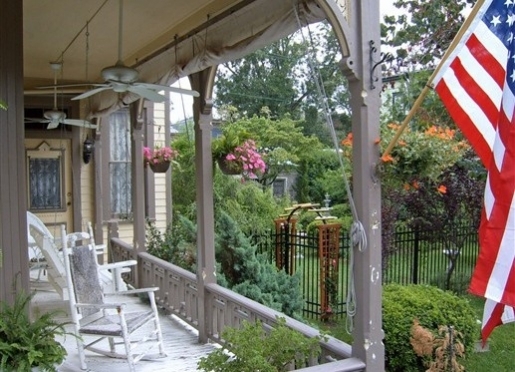 This room is so conveniently located on the first floor, (for those who do not want to deal with stairs), with a private ¾ bath, (shower only), and a private entrance to the side porch, w/porch swing), and offers a view of the side garden. Wireless WIFI connection is available to all our rooms. Our normalrates for rooms with queen beds, start at $169.00 weekdays, (Sun-Thurs) & $189.00 weekends (Fri-Sat).These rates include a full breakfast each following morning. We require the cost, equivalent to a one day stay, for deposit, (non-refundable, however, transferable to a future reservation within one year). We accept Visa, Discover, and MasterCard. 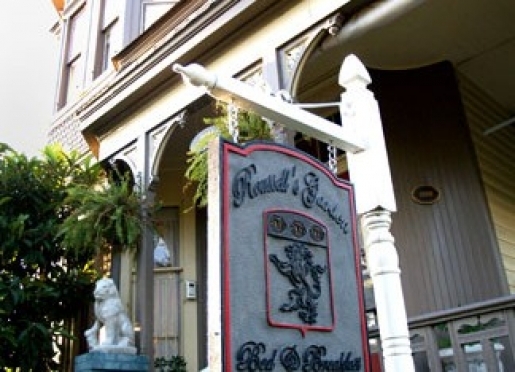 You can book online at www.roussellsgarden.com, or contact us by phone for reservations. 912-239-1415. Travelers are always looking for memorable and relaxing experiences. Let’s discover more through the words of our innkeepers. Many thanks to Bryan Roussell for sharing his own secrets with BBOnline.com! Our guests say that our prices, great hospitality, and wonderful breakfasts are what bring them in. 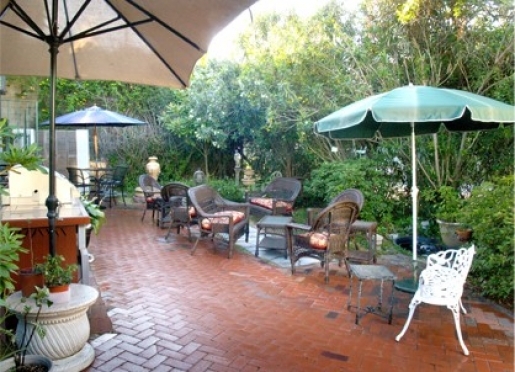 Roussell's Garden is best known for our lovely garden, our breakfast and our warm and comfortable atmosphere. Savannah is known to be a romantic destination and travelers can walk to everything in the area. To quote a guest: “You’ve got it together”. 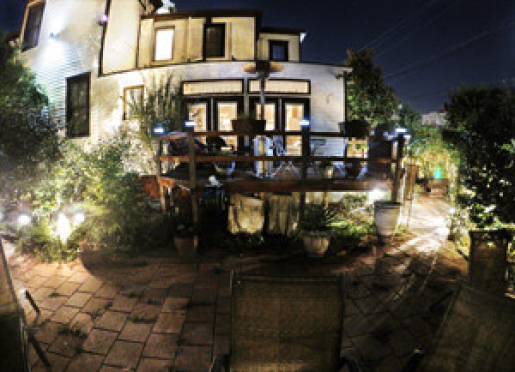 Our guests love our warm and inviting atmosphere. 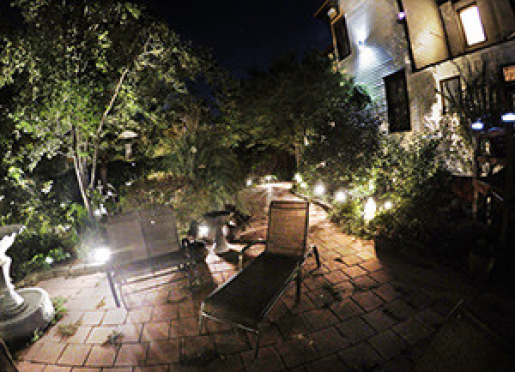 We are very personable with each guest and make them feel like this is their “home away from home”. Savannah is the “Hidden Jewel of the South”. There is always something to do. We are a 1 ¼ miles from the river, and right in the middle of the historic district. 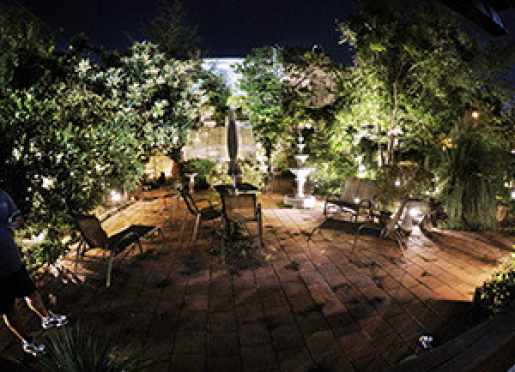 Savannah also offers wonderful nightlife! 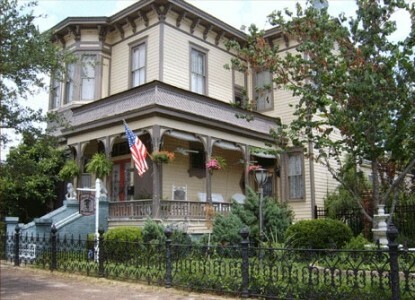 We suggest our guests take a trolley tour to experience the basic history of the area. The Savannah College of Art & Design hosts many different events and activities as well. Everything is within walking distance to the Inn. We are right in the middle of the historic district and 2 blocks from Forsythe Park. 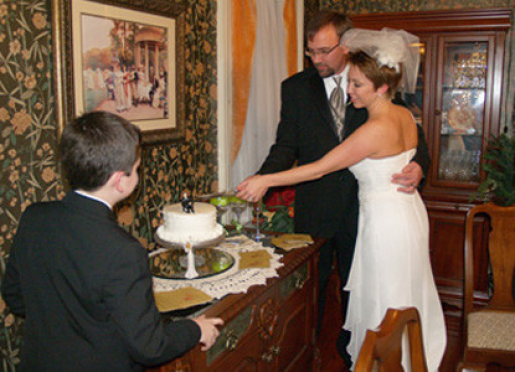 Some of our favorite restaurants in the area include Vic’s on the River offering live music daily and stunning views of the Savannah River, The Olde Pink House serving traditional southern food, Leoci’s Trattoria which serves elicious Italian faire, and The Lady & Son’s ( Paula Deen’s restaurant), which offers delicious Southern cuisine. We are a romantic inn and do not allow pets at this time. 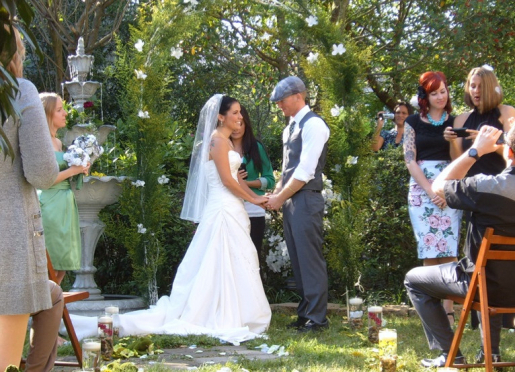 Roussell's Garden Bed and Breakfast offers a truly romantic and intimate wedding setting. Whether in the gardens, the courtyard or the inside parlors your wedding will have an outstanding venue to be appreciated. 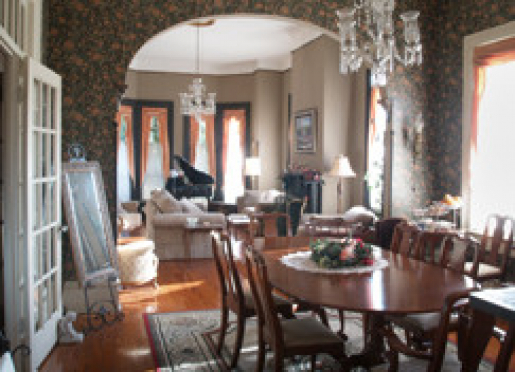 Roussell's can accommodate up to 50 guests throughout the facilities and your wedding in this stately 1888 Victorian home will become a most treasured moment. A walk through the gardens at Roussell's Garden is a treat for the senses. You'll see lush blooming vines, smell the citrus and fig trees laden with fruit and hear the soft songs of birds that are welcomed with birdbaths and feeders. Start your day with a pensive tour of the garden before breakfast. 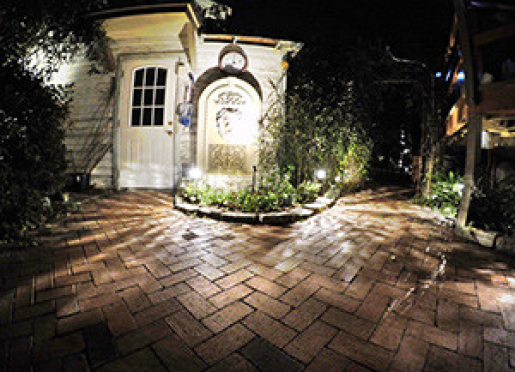 Roussell's Garden is the perfect setting for a relaxing hour with a book under a tree or a glass of wine at a shaded bistro table after a long day of sightseeing in Savannah. Peaceful bubbling water sounds from several fountains make this a place to unwind away from your business meetings. You may want to share a quiet dinner out on the patio made from the original bricks and a state of the art gas grilling center is available.